In early May 2015 we left our home in Western Australia and didn't return until the end of October. Our tickets were booked before we knew we'd need to be at a wedding in England at the end of September. Rather than make two trips across the world, we decided to stay away for the five months. But how to do it with limited funds? Paying for all our meals and accommodation was out of the question so we investigated buying a motor-home when we got to Ireland where our son lives. We looked at various vehicles online and were confident that we could find a suitable vehicle within our price range. We weren't looking for a top of the range motor-home; just a serviceable, reliable vehicle with a shower and toilet. We ran into problems with high insurance and licence fees because we weren't Irish residents. Although my husband was able to get Irish citizenship before we came home, we left it too late to arrange the necessary documentation before we left Australia. In the end we bought the vehicle in our son's name which saved us a heap of money. We found a suitable Iveco motor-home in our first week. Although it was a 1997 model, it had only done 44,000 miles. It had four seats, all with seat-belts. The front seats swivelled. There was a bed above the cabin but we didn't use it. We're getting a bit old to be clambering up and down a ladder into a cramped space. It had a three-burner gas hotplate and a grill but no oven. The fridge would operate off gas, mains electricity or 12-volt. The toilet was a cassette-type and the shower was a spray-head held in a bracket. This was pretty much worse than useless and we didn't use it. We either washed in the basin or showered in the caravan park facilities. The U-shaped dining/lounge area was at the back of the vehicle. We set this up as our double bed. We were too lazy to put it up and down for meals so either ate on our laps or outside using a fold-up table and chairs. It had the usual cupboards and a hanging area for clothes. About a month after we bought it, it had to go through the MOT test which it passed without any worries. We found a very efficient mechanic near Trim who gave it the once-over for us and pronounced it in excellent order for its age. We also had the muffler replaced and bought a GPS. Over the next five months we did 11,000 miles in it without any problems. We first toured round Northern Ireland. At Carrick-a-Rede we joined the National Trust and made good use of it in Northern Ireland and later, Great Britain. We visited the Giant's Causeway and toured the Bushmills Whisky factory. In June we headed to Rosslare and caught the ferry to Cherbourg in France. It was a bit spooky driving off the ferry into mainstream traffic on the 'wrong' side of the road (to us) and with very little idea of where we were going. By nightfall we'd found Bayeux and seen the famous Bayeux Tapestry. We spent that night in an Aire in the town where we paid €4 to camp in a carpark. Aires can be found throughout France and are stopovers for motor-homes and caravans. Facilities offered vary. Fees are usually minimal so if you are somewhere near self-sufficient, they are a good option. We were advised against using those at major service areas because of security issues. We also did some free camping if we found a suitable place. We travelled to Tremont and stayed at a France Passion site. There are basic sites at farms, vineyards or artisans' houses. For a nominal fee, you can camp. In return it is courteous to try their wares and to at least consider buying food, wine or other items from them. We visited the French National Equestrian Centre at Saumur then headed south to Availles-Limousine. We passed through numerous small and lovely villages and after a few days made our way to Freiburg where we met up with a friend. A visit to an Open Air Museum (Vogtsbauernhof) in the Black Forest was a highlight. We stayed one night on the Bodensee then passed into Bavaria, then Austria and the Czech Republic before heading back into Germany. The architecture and age of some of the attractions made a huge impression on us. We saw some wonderful cathedrals and castles. We then went across the top of France visiting some of the World War I and II battlefields finally catching the ferry from Roscoff to Portsmouth. A tour through Yorkshire, up to Edinburgh, Glasgow and back through the Lakes District to Shrewsbury followed. We then headed for Guildford, London to attend the wedding. After a few days in the south of England and Wales,we caught the ferry back to Dublin. We had no mechanical problems. We drove up to 3,000 metres through the mountains of Austria with no problems. Gas bottles and fittings in the different countries varied and caused us a few headaches. We ate out occasionally and enjoyed the local coffees and cuisine from time to time. But we saved heaps by mostly having breakfast in the motor-home. We had many enjoyable lunches in lay-bys. We would purchase a selection of cold meats, some salad ingredients and bread in a village then stop to make lunch along the road. If we felt the need, we'd stop and have a nap in the afternoon, or make a cup of coffee. We researched traffic rules for each country we passed through and found it necessary to purchase some items such as breathalyser test kits and Hi-Vis vests. Going into Austria we also needed to pay to use the toll roads. This card had to be purchased before you drove on the roads. Around 4 or 5pm each day we would start looking for a caravan park or camping site. The most we paid was about €38 a night for a site close to the centre of Paris. We also found lovely sites besides lakes with adequate but less salubrious facilities for as little as €9. Use of washing machines and dryers were usually extra. Sometimes hot showers were a euro for 3-6 minutes. Internet facilities were very hit and miss but mostly miss. We have kept the van in the hope that we can do more of the same next year. We will then sell it and expect to get almost as much for it as we paid. For us, this was the ideal, and probably only, way, for us, to spend five months on the road. 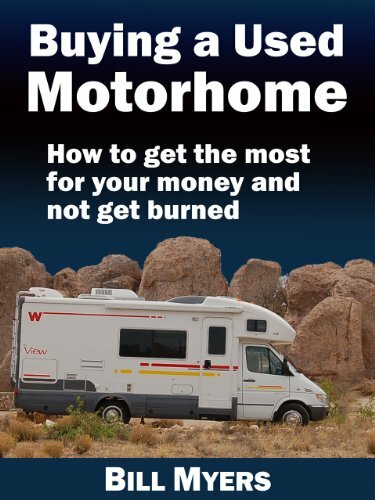 If you have the wherewithal to layout the money for a motor-home, I could recommend the experience. We can't wait to get back and do some more exploring. You're quite right. B & Bs or hotels would have been way too expensive for us. And because we didn't buy a top of the range vehicle we shouldn't lose much at all. Thanks for the comment.